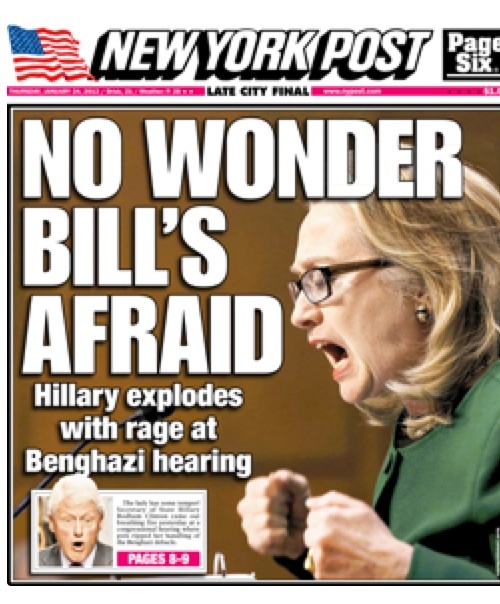 The New York Post (a sister company to Fox News) posted a blatantly sexist and hostile cover referring to Hillary Clinton's Congressional testimony earlier in the week with an angry photo of her next to the headline, "NO WONDER BILL'S AFRAID: Hillary explodes with rage at Benghazi hearing." Besides the offensive sexism, it's also quite an overstatement of her conduct. Even Fox News merely called her testimony "at times heated," as opposed to some kind of outburst, as the Post implied. But in a radio interview this week, Chris Wallace approved of the cover, calling it, "Funny. Nice can be overrated sometimes." Screen grab and audio below via Media Matters. In what way is that sexist? Thx4 Fish wrote: And I regret she’ll be leaving a job she did so well. Well, she might be leaving but let us hope to bigger and better things, things like another presidential run to become the next president of the United States in 4 years time. Hillary did a great, professional job at the hearing. No headline can change the facts of her testimony. No matter how much the right wishes it otherwise, Hillary won this one. And I regret she’ll be leaving a job she did so well. Yet when any comedian tells any joke at all about the Whore of Babble-On Palin, little Chrissie doesn’t laugh, but pitches a hissy fit. Go figure. they’re trying to play down the fact she pwned right wingers once again.